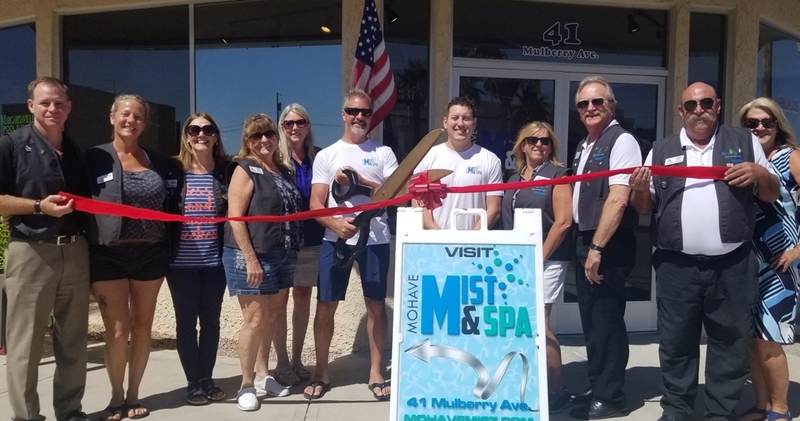 The Lake Havasu Area Chamber Ambassadors held a ribbon cutting ceremony for Mohave Mist & Spa celebrating its new location at 41 Mulberry Ave. Come in and browse the Patio Furniture, BBQ/BBQ Islands, Saunas, Billiards and more. Get a High Pressure Misting System that will not get you wet. A second location is now open at 5559 Highway 95, Suite #2 in Ft. Mohave. Attending the ceremony from left to right were Shane Delaney, Jennifer Whetten, Kathie Schuler, Sharon Oakley, Audrey Hoyt, Sam Harrison, Nick Hernandez, Janina Robertson, Steve Bentley, Lucky Atkinson and Lisa Krueger.